"I appreciate the fact that no two cases are ever the same. This allows me to experience something new every day, which is what I strive for professionally." 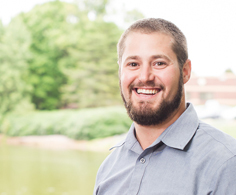 Garrett Wood, Professional Engineer, began his career at DELTA |v| in 2015 after earning his Ph.D. in Biomedical Engineering, with a focus in Injury Biomechanics, from Duke University. Garrett also holds a Bachelor’s degree in Mechanical and Biomedical Engineering from Duke University. As an undergraduate and graduate student, Garrett worked in the Duke Injury Biomechanics Laboratory as a research associate. He investigated blast and blunt trauma models for traumatic brain injuries and Hybrid III dummy skin for automobile crash applications. Garrett’s education and friendly personality make him a great addition to the DELTA |v| team. He is regularly involved in field work, which includes data collection, truck downloads and investigations. He is also entrenched in drawing production, vehicle accident reconstruction and vehicle system analyses. Garrett brings his unique background in crash injury biomechanics to the DELTA |v| list of services and thoroughly enjoys analyzing these types of incidents. Originally from Charlotte, Garrett is happy to be back in the area. On weekends he enjoys spending quality time with his family and participating in outdoor activities such as camping, fishing and hunting. You may also catch him cheering on the Duke University basketball team from time to time.